For someone who isn't sure about Benefit I've been posting about them quite a bit recently! 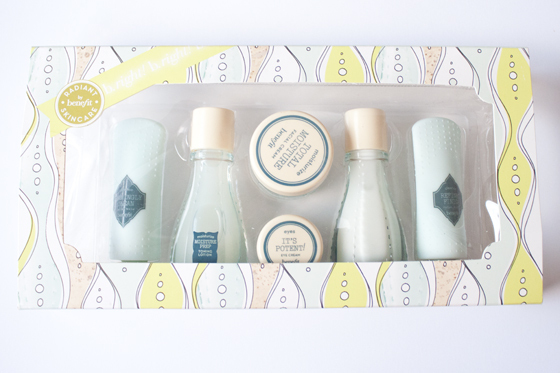 I just thought I'd share this mini Benefit skincare kit that I spotted on ASOS for a cool £10. As I thought it would make a great little gift idea if you were on a tight budget. I was drawn to the kit as, similarly to the Benefit Tan About Town Kit, it has that "brand name appeal" without breaking the bank. In the Benefit b.right radiant skincare set you get 6 sample sized items from Benefits skin care range in a clear plastic makeup bag. The kit contains a miniature triple performance facial emulsion, moisture prep toning lotion, foamingly clean facial wash, refined finish facial polish, total moisture facial cream and it’s potent eye cream. They all come in nice study glass packaging or heavy plastic which makes the kit feel alot more expensive than it is. I've heard a bit about the B.right skincare range when it launched from reviews on Temptalia, but I've not tried it out myself. 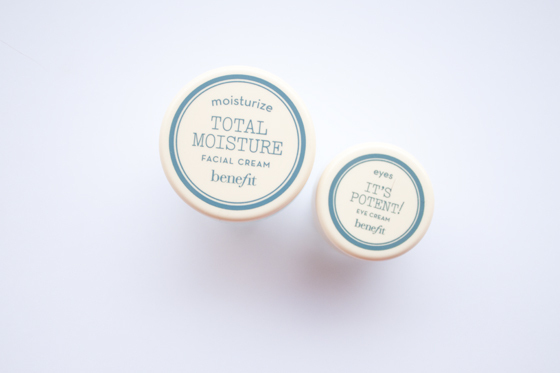 I think the packaging is really nice and simple for Benefit. 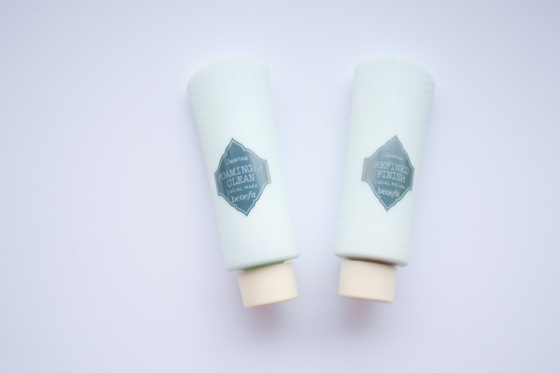 Although it does have that playful element that runs through the whole Benefit skincare range it also reminds me of all the old fashioned lotions and potions my Granny would have in her bathroom. 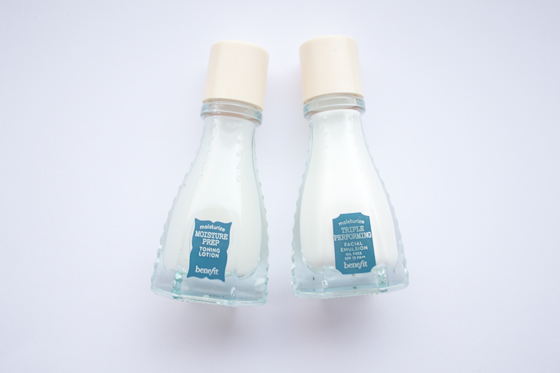 The samples/miniatures are generous sample sizes would last a week or two at a push. Which is generally enough time to try out a product! I know from experience its so annoying buying a full size kit of face products only for them not to work for you. I actually bought this one for a friend who I know needs a bit of cheering up so I bough her the gift! Like I said Ive not actually tried the products themselves, But I am tempted to buy myself a little kit to try though. The price is really good at less than £2 per item, and coming in a clear zippable pouch which can be used for other things. This is something I'd personally like to received off someone as a gift! So I think she'd appreciate it. I think I will probably end up buying myself a set of Benefit b.right radiant skincare to try out to review, so do watch this space! I thought I'd just share this as a little gift idea right now though! I find it so hard to buy presents for people sometimes so this may help those of you with a friend/sister/whatever's birthday coming up and if you're on a budget! Sounds like a great value set! 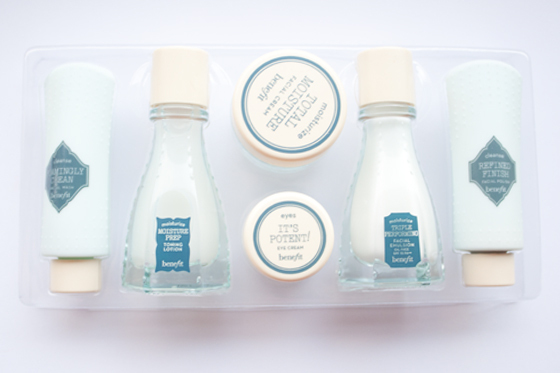 I have the triple performing facial emulsion and I really like it, but I do really like the idea of the mini set! Really great! But im not too keen on benefit products either. Please check out my giveaway. I love Benefit, and I loved the kit as it was a great way to tell which of the items I liked and which I did not. I ended up finding out the eye cream gave me an allergic reaction, the face cream is absolutely amazing and the face scrub is now my everyday scrub! The bottles are so cute and old school looking. I wouldn't mind trying their skincare. Excuse me for being so negative but I HATE THESE PRODUCTS. I have dry skin, and although I don't get really bad acne I get more spots than most. I was sold this, along with the full sized moisturizer, by the benefit girls and my skin just felt really oily, before breaking out to the worst it has ever been. These are extremley heavy, greasy and scented and I'd hate to think what they would do on oily skin. Don't get me wrong, I love Benefit make up. But they should stick to what they know and leave the skin care to experts. Great gift idea! And really affordable aswell especially with it being a benefit product! I bought the full size eye cream and moisturiser = waste of money. Wow great price for Benefit! Really liking the apothecary style bottles! For instance, challenge video games not just need Sumdog Tips one hundred percent focus on the job available. Nonetheless, it is a fantastic choice, specifically for those that do not intend to jailbreak. tweakboxx Blink Apps: Apps that should not exist in App Store.